This scene is relatively simple to draw, the horizon line was placed about a third of the way down the watercolor paper. As I wanted to feature the water in this scene I decided to show very little sky and land in the distance. 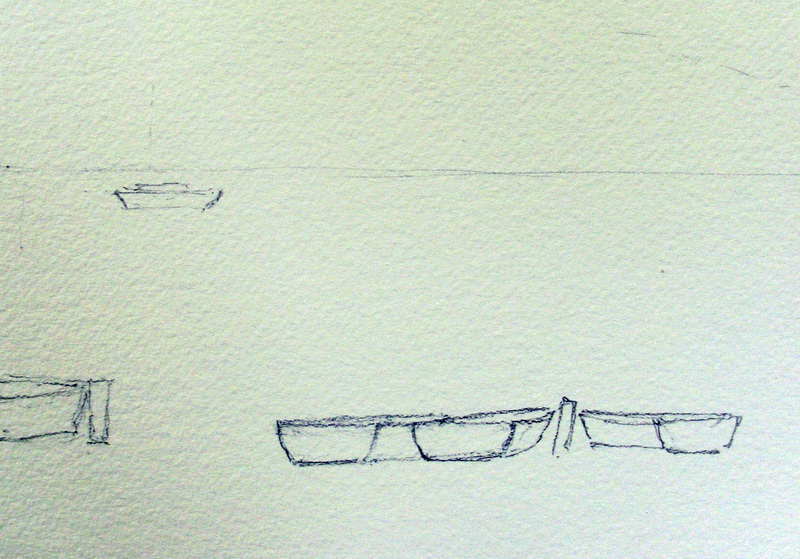 When drawing boats keep them relatively flat looking unless you are looking down on them from above. As the row boats are closer to the foreground they appear larger than the sail boat in the distance. I have not drawn in all the sail boats as they will be done with quick brush strokes as very general shapes later in the demonstration. I have drawn in one sail boat just to give you an idea of what its hull looks like. The sail boat shapes were kept quite simple due to the size of the painting and the distance of the boats from the viewer. Because I have chosen a low viewpoint you can only see a small section of the tops of the row boats. Notice how, when drawing boats, the boats are drawn closer to the horizon as they appear further away from the viewer. When you study perspective you will discover that all things below the horizon line will appear to move up towards the horizon as they move away from you. While all things above the horizon will appear to come down towards it as they move away from you. You can see his with clouds, those a long way away will appear to come down to the horizon line. At the top right hand corner I have lightly indicated the tree line at the edge of the island in the distance.